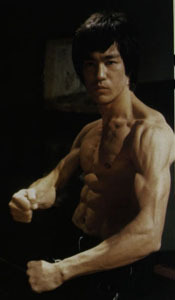 Jeet Kune Do is Cantonese for "The Way of the Intercepting Fist". Lee found that the highest expression of combat was the ability to stop your opponent's attack mid-stream with an attack of your own. In Jeet Kune Do there are no "uniforms" in the traditional sense of the word. Neither will you find kata (preconceived forms that are used to teach technique through mimic and memorization).There is no belt system (but some individual schools do have "levels"). There is weapons training available in most JKD schools. The weapons are usually modern and practical and are used not only to teach techniques of attack and defense but also to develop attributes.